The Journal of Agricultural Economics and Management is published thrice annually by Enriched publications. 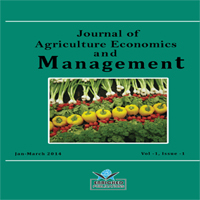 Journal of Agricultural Economics and Management is peer reviewed journal and monitored by a team of reputed editorial board members. This journal consists of research articles, reviews, and case studies on Agriculture & Biotechnology. This journal mainly focuses on the latest and most common subjects of its domain.